"A hardworking, dedicated woman who has a sense of humour - what's not to love," asks one person on Twitter. 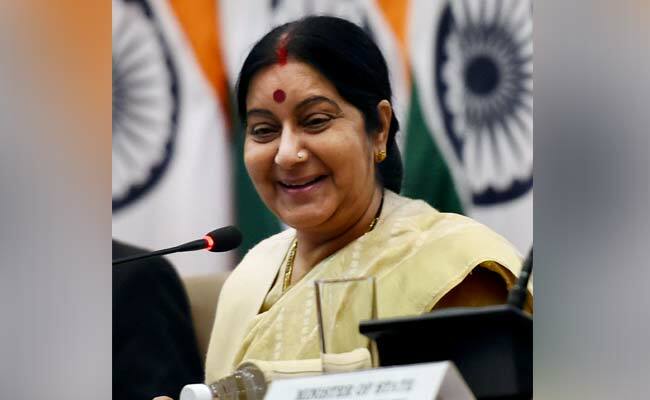 With over eight million followers, External Affairs Minister Sushma Swaraj is among the most followed world leaders on Twitter. According to the global public relations and communications firm Burson-Marsteller, she is the only woman among the 10 most followed world leaders. And yet, she manages to respond to an admirably large number of SOS tweets on the micro-blogging site. From Indians stranded in conflict zones to visa or passport issues, she often tweets back to people offering to help in any way she can. But, let's face it, some requests are more bizarre than others. Last year, someone asked the minister for help with his refrigerator and another tweeted about his car. But Thursday morning's SOS tweet to Ms Swaraj was literally out of this world. Early this morning, Karan Saini tweeted the minister writing, "I am stuck on mars (sic), food sent via Mangalyaan (987 days ago), is running out, when is Mangalyaan-II being sent?" He also tagged the Indian Space Research Organisation in the tweet. Two hours later, the minister replied, "Even if you are stuck on the Mars, Indian Embassy there will help you." The epic response has quickly gone viral with over 2,200 retweets and over 4,500 'likes' in less than an hour. bravo ! that called celestial diplomacy !! There are new lessons in commitment to work, sincerity & ability to delight the served I draw from you daily. Sushma ji you are an inspiration on how to maintain your sense of humor even in some of the most difficult jobs on this earth.